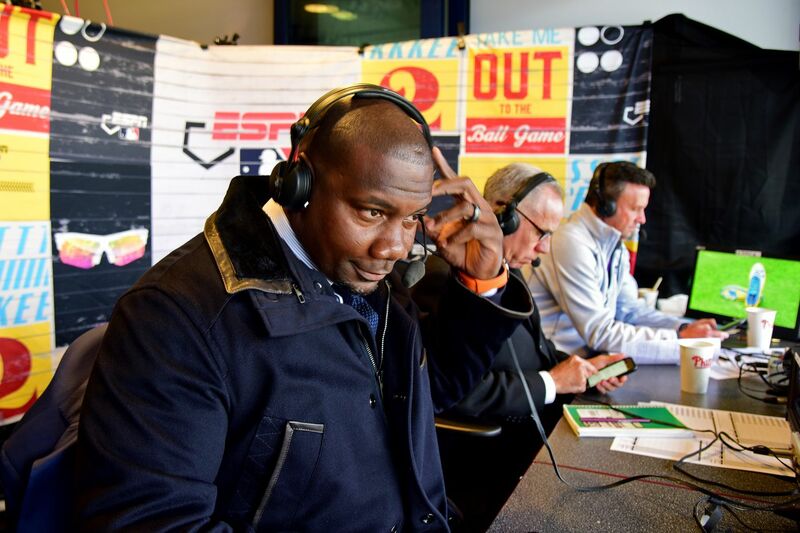 Ryan Howard made his debut as a color commentator for ESPN with Monday night's broadcast of the Mets-Phillies game at Citizens Bank Park. Ryan Howard was back in the ballpark Monday night, back in the middle of an order trying to make an impact on the game of baseball. Nearly 15 years after slamming his first big-league home run against the New York Mets at Shea Stadium, Howard was launching a new chapter in his career. This time, he was sharply dressed in a designer blue suit and part of a team that included veteran broadcasters Karl Ravech and Tim Kurkjian. Ryan Howard trades in his uniform for a suit and tie, as he prepares in the restroom mirror to do his first ESPN telecast. Becoming a broadcaster was always in the back of Howard’s mind during his 13-year career with the Phillies, but it was put on hold in 2017 as he attempted comebacks with Colorado and Atlanta minor-league affiliates that did not come to fruition. Once playing the game was out of his system, he was able to focus on a different aspect of the game. That last part is important to Howard because his 18-year-old son Darian is in the midst of his senior high school season in Georgia. Howard, 39, will serve in a variety of roles for ESPN. In addition to working as a color analyst, he will also make studio appearances on First Take, Baseball Tonight, SportsCenter, Get Up!, and ESPN Radio. Howard said he is unsure whether he will be better suited for the studio or in-game productions. Howard had known for more than a month that his in-booth debut was going to come at Citizens Bank Park in a game between the Phillies and New York Mets, and he certainly has some vivid memories of the rivalry. “Obviously by signing Bryce Harper the entire city perked right up,” Howard said. “I think that was the case with everybody in the clubhouse, too. John set his mind to what he was going to do and he did it. He said, ‘We are going to go out and do what we need to do in terms of making this team competitive again.’ That’s what you want from your owner and general manager. They stuck to their guns and did it. Ryan Howard is the first one in the broadcast booth, an hour before his debut as a color analyst on ESPN's Monday Night Baseball telecast for the Phillies-New York Mets game at Citizens Bank Park April 15, 2019. The Phillies’ challenge, according to Howard, is that some of the other great lineups in baseball also reside in the National League East. In fact, he sees a potential four-team race to the finish. And Howard, who has a multiyear contract with ESPN, will be more than happy to broadcast them from the booth and analyze them from the studio. He’s in the middle of a new lineup and he seems quite comfortable there.